Captive Faith, Did You Know? In 2008, our founder Dr. Ken Curtis (1939–2011) wrote this introduction for prison testimonies throughout church history. Christians in prison have shared similar stories through 2,000 years. The first letters we have from an imprisoned Christian are from the apostle Paul. Perpetua wrote an account of her imprisonment and trials. From prison, Christians have produced classic literature that comforts and challenges. For some prisoners, the plunge into the depths became a step heavenward. Letters Hus wrote from prison. What does prison ministry look like today? We Interviewed five individuals active in prison ministry to get first-hand accounts. Some figures to put American prisons in perspective. 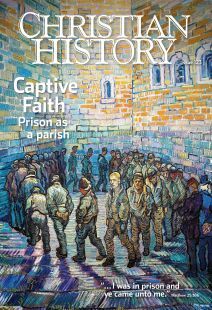 Here are some recommendations from CH editorial staff and this issue’s authors to help you navigate the history of Christians in prison and Christians ministering to prisoners.